How am I meant to feel? How am I meant to know? I am not the girl, that you want, by, your, side. 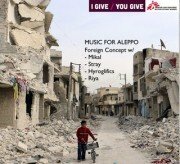 I’m giving away 8 previously unreleased tracks in return for a donation to the charity Doctors Without Borders/Medicines Sans Frontieres in order to aid them with the work they are currently doing amongst the travesties that are currently occurring in Aleppo and across the rest of Syria. 100% of your donation goes directly to the charity. My friend in Bristol managed to escape Syria last year (part of his journey involved swimming across the English Channel in the middle of the night) so the situation over there is something I’ve followed closely. Doctors Without Borders support eight hospitals in the city of Aleppo. They also run six medical facilities across northern Syria and support more than 150 health centres and hospitals across the country, many of them in besieged areas. I’ve set the minimum donation for 8 tracks as 4 pounds but please give what you can. Thanks to Mikal, Stray, Hyroglifics and Riya for their involvement in these tracks.